Chuseok or Korea's Thanksgiving, is a festive season when families reunite. Instead of getting bored in front of television after catching up on the latest gossip among relatives, family outings can provide more entertainment, and a variety of programs are available at amusement parks, palaces and museums. Seoul's Lotte World stages performances of a traditional circle dance at 8 p.m. from Friday to Oct. 3. Inscribed on the UNESCO Representative List of the Intangible Cultural Heritage of Humanity in 2009, Ganggangsullae is a seasonal harvest and fertility ritual popular in the southwestern region. Visitors can also enjoy other traditional performances such as samulnori (quartet percussion), fan dances and folk songs. 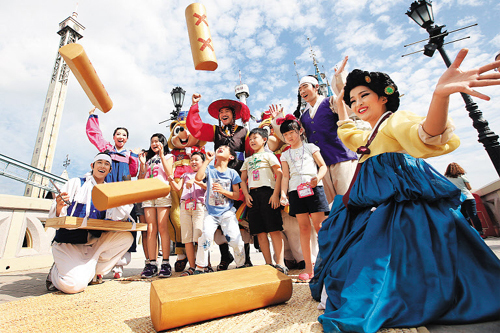 Seoul Land in Gwacheon, Gyeonggi Province, is also preparing traditional performances and games including tightrope walking and parades of character dolls. From Monday through Wednesday, Taekwondo-themed performances will be staged at 3 p.m. blending the martial art with dancing routines, while martial artists will also demonstrate breaking wooden boards and give short scripted performances. Visitors can also participate in board games played by tossing four sticks (yut-nori), or striking rice cakes with a mallet (ddeokme-chigi). The COEX Aquarium in Seoul offers visitors the chance to enjoy unique performances staged in water. Divers wearing hanbok, or Korean traditional dress, will jump on seesaws (neol-ttwigi), throw arrows into a narrow barrel (tuho), and walk on tightropes. A huge school of "dancing" sardines will also delight onlookers. Meanwhile, the Korean Folk Village in Yongin, Gyeonggi Province will offer a slew of activities. Traditional rites will be demonstrated and visitors can tuck in to some ritual food offered at ancestral ceremonies. Agricultural equipment that was used to harvest grain and crops will also be displayed so visitors can get some hands-on experience of operating them. Jongmyo, a Confucian shrine, several palaces and numerous Chosun-era royal tombs will also be open to the public free of charge on Sunday. Those who turn up wearing hanbok will also be able to enter without paying from Saturday to Monday. A variety of programs will be offered at popular sites like Changgyeong Palace, where visitors can take photos with a performer dressed as a Chosun-era queen between 2 p.m. and 4 p.m. on Sunday. For more information, call the Cultural Heritage Administration at 1600-0064. The National Museum of Korea will stage traditional music performances from 3 p.m. on Sunday accompanied by explanations by Hwang Byung-ki, a virtuoso player of the gayageum, or 12-stringed zither. For free tickets, online reservations can be made at museum.go.kr. Chuseok or Korean Thanksgiving celebrates nature's bounty. At a time of the year when rice paddies and other plots of farmland are filled with bumper crops, even the poorest farmers make rice wine and pick the ripest fruit and present them on altars for ancestral rites. Koreans in the past chose the best times of the year for holidays and prepared sumptuous tables to honor their ancestors and share the food with their family and friends. There is a Korean saying that goes, "Not more, not less. Just be like Hangawi (another name for Chuseok)." The saying refers to the fact that the Chuseok holiday falls on the best time of the year with moderately cool weather and warm sun and, more importantly, abundant food from the fresh harvest. It was common to prepare a lavish meal and enjoy it with the entire family and friends who had toiled hard in the field from spring until fall after performing ancestral rites. These days, Chuseok has lost a lot of its true meaning, with fewer and fewer people holding ancestral rites, and preparing smaller amounts of food to put on ritual tables and to share. But one thing remains the same about Chuseok: it is till a time of the year when family and relatives travel long distances to get together and pay their respects to their ancestors. When you wear hanbok, you need to make sure that your makeup matches the traditional Korean costume. What is important is to emphasize a clear complexion and use the right blusher. To moisten your skin properly, take preparatory skincare steps before applying makeup base and foundation, and be careful not to put them on too thick. If you have dark circles under the eyes or spots around your chin, you can use highlighter to lighten the skin tone. When applying blusher, make sure you do it in a U shape around the area that protrudes when you smile. Repeat this lightly several times to create a natural and slightly flushed skintone. If you have dry skin, apply a small amount of powder with a brush on your brow and nose. If you have oily skin, apply powder all over your face lightly by using a puff. As for eye makeup, avoid dark colors. Use pearly pastel colors and apply them lightly. Water-proof mascara is good for the Chuseok holidays, when women often have to work so hard they can hardly find time to adjust their makeup. If you want a natural makeup and look as young as possible, don't wear lipstick too thick. Moisten your lips with lip balm before putting the lipstick on. 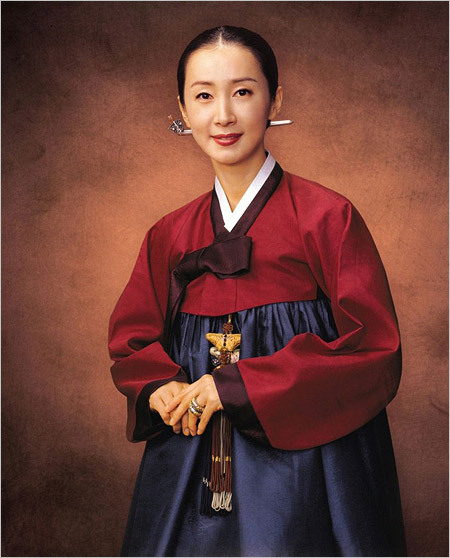 Use a lip liner in colors matching your hanbok and apply lipstick with a brush. Finish it with a lip gloss that also matches the color of your hanbok. So a very Happy Chuseok/Hangawi/Korean Thanks giving festival to all the viewers.